Our studio is located on W 86th St. and is easily accessed from anywhere in the city. The studio is ideal for both video production and still photography. 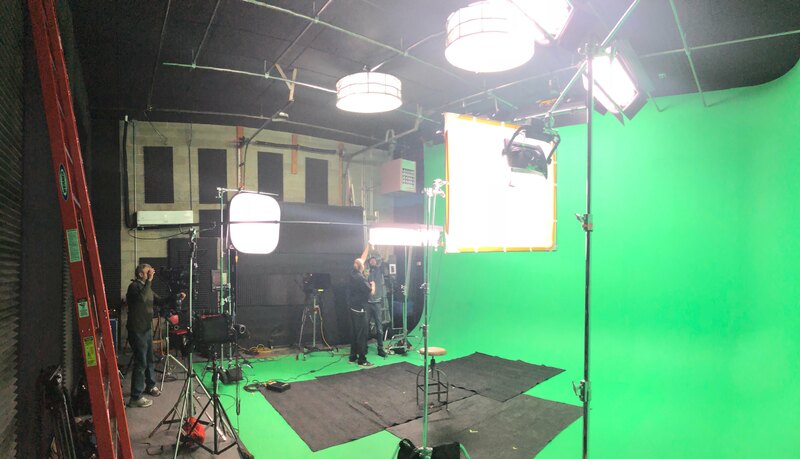 Our 25′ X 25′ x 16′ high green screen cyc wall services a myriad of video productions. From ad work to training videos, the studio is equipped to handle your needs. Utilizing green screen technology, we create and customize virtual sets, graphics/logos and high end sound & music for each and every production we take on. FME offers teleprompter services in studio to ensure you stick to the script. Once your video is shot, we have a state-of-the-art editing suite that can handle intensive video productions with ease. Having a great facility is only half the battle. We employ some of the best videographers, editors and graphic artists in the city. Our streamlined studio set-up and approach to filming and editing keeps our production time down so we are able to deliver timely videos for your business. Your project is always in capable hands when you work with FME Studios. We hope you will stop by and check out our offices and our studio soon! Hello my name Richard R. Im looking forward to have a video created by your spectacular!! team. the video is 4mins long.i need to know pricing and availability ive drawn up some sketches to help create the concept of the video i can be reached at 3178015267 thanks and have blessed and wonderful day and thank you again. Hi, my name is Bruce Farr. I pastor a church here in Indy: overcoming church. I am a gospel blues guitarist/singer songwriter and would like to do a music video of my feature song “The Blame Somebody Blues”….